Centrifugal pumps make high frequency vortex pulsation from tips of pump impeller blades. Pumping through a no moving parts damper interceptor disperser = smooth flow. Schematic AODDeD pump, air driven double ended diaphragm pump. Pumps up to 100 psi / 7 bar, mainly for transfer pumping and viscous liquids. AODD pump section view, with pump damper and pumping through flow meter. Dampened flow makes metering readable. Damper size reduced by large air supply. Hose pump, large version of the peristaltic pumps type. AKA Flex Tube pumping common for sludge, slurry, and solids carrying liquid systems. Shown here with an inline flow through hose type Pump-Guard. Gear pumps, of the external gear type, often run fast and pump at high frequency. Pumping here through a ball pack no moving parts WaveGuard dampener. Internal gear pumps at a lower pump shaft RPM used for thicker more viscous liquids but that have more lubricious qualities. These produce a low frequency pumping "ripple" which is easily damp able. Fixed and variable vane pumps exhaust a high speed chatter shown here being handled by a WaveGuard of the "tapered snorkel" dissipater design. A pump pumping super smooth. Air piston pump 1 of the reciprocating intensifier pumps. The pumping action is usually a fast suction stroke but a slow discharge stroke. Often results in low volumetric efficiency sharp pulsation. API 674 triplex power pumps and the quintuplex multiplex pump can make quite smooth flow, but the PSV - RV can often cause massive pulses. Cam & offset roller pumps may have pumped volume control by limiting the return stroke. Typically the pumping action is sharp but only requires small dampers. Solenoid dosing pumps for pumping shots of chemicals, often into water treatment systems. Pump dosing control is both by setting shot frequency and by stroke length adjustment. Packed plunger pumps, the most volumetrically efficient pump type. Unless secondary containment is necessary, can be best used for pumping most liquids. Flow control by VSG gear. Hermetically sealed diaphragm head pumps, with "sandwich" diaphragms, and hazard alert detection between them. 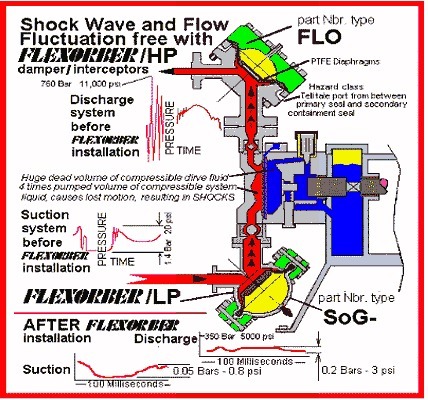 Secondary containment sealing, this pump type often deployed for pumping toxic, pyrophoric, and dangerous chemicals that are compressible, causing a fall in volumetric efficiency - which in turn results in shocking pulsation. Variable stroke metering pumps example Prominent Orlita etc. increased fixed stroke, with flow control by variable speed gear electric frequency variation on feed back loops provide mass transfer rate accuracy pumping with this pump type. B&L "Novaplex" is a pump made from several pump heads that are ganged together on one shaft and may be of different sizes for pumping different fluids proportionally. Dosapro API 674/675 pumps pump from individual heads with their own gear boxes. Process liquid pumping is from elastomer backed TFE diaphragms. Lewa Robust off-set lobe crank multiplex mono block pumps have great pressure ability for pumping process fluids. Each pump head has a PTFE "sandwich" two layer diaphragm. Hydro-Drive intensifier pumps for "Fracking" service. Typical ratio of drive oil pressure to frac fluid 5:1 makes a 25,000 psi / 1725 bar pump that can be used for pumping difficult liquids including drill mud. Progressive cavity "PC" pumps used for pumping high viscosity liquids including small particles. At certain RPM and viscosity this pump type can produce very low pulsation. Lobe or "rotary piston" pump 2 & 3 lobe pumps used for pumping grit free but thick liquids. Flex-Vane pump, a most versatile pump used for bilge pumping, even driven by hand, power tool chuck, for stop spill cleanup. Range of sizes typically from ITT Jabsco. Drum pump, one of the peristaltic pumps. Typically used for pumping out of barrels. PUMPS make FLOW, SYSTEMS make PRESSURE, pressure pulsation is system response to flow fluctuations from valves etc., system response is a a SYSTEM RESPONSIBILITY, Not a Pump Vendor liability. "Close coupling", THERE IS NOT SECRET - SAVE HALF THE COST, BY HOW IT IS PIPED. Pump pulsation dampers designed, tooled, and manufactured in house.